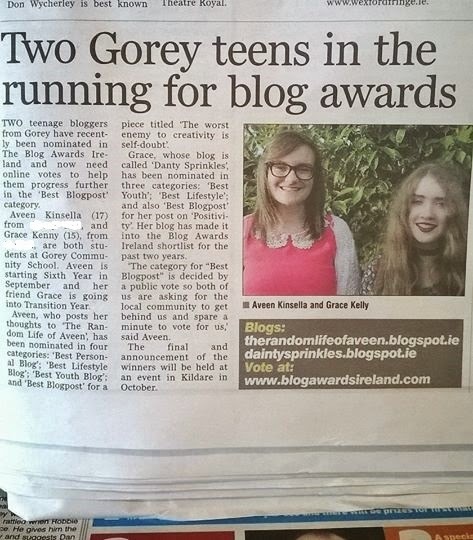 I'm starting off this post with some dead cool news that Aveen and I are in our local newspaper this week because of being nominated in The Blog Awards Ireland - Specifically the fact that we need votes for the category 'Best Blog Post' that we're both nominated in. So whether you vote for my post or you vote for Aveen's post, we really appreciate the support and votes - It's amazing to be nominated in the first place before even thinking of the votes ! On the humorous end of things, My surname was spelled wrong in the caption of the photo which is literally the story of my life (not that I am complaining.) but we were so excited to read the article in the newspaper just like #teenbloggersrepresent ! I didn't really just hashtag, did I ? Anyway, you can still vote for either of our blog posts here, Thank you so much. Today I was up in Dublin to see family and we had a nose around the botanic gardens where we had lunch which was a seriously yummy panini with chips (I didn't take a photo of it.) and it almost got strangled hugged by me but instead I decided just to eat it rather than just stare, like I was going to eat it anyway but I didn't want to wait ! After that we had a look around some of the greenhouses - somewhere I hadn't had a look around before - and if you couldn't tell from the photos, the tropics and rain forest ones were my favourites mainly because I was surrounded by tons and tons of cacti and succulent plants, it was like heaven ! All these plant photos were taken on my phone so I've left out a few which I felt weren't that great, but please let me describe to you the layout of this greenhouse ! There were so many little pots of cacti and succulent on the windowsills and then in the centre three were these huge tall cacti as well as some miniature sized ones in the ground. I also enjoyed the orchid greenhouse which was quite pretty but not as beautiful as all the cacti ayy ! This is probably the last post in which you're going to see mad colours in my hair until next summer. *Bawls eyes out*. I'm getting ombré redone on Friday which I'm really excited for since as much as I'll miss the greens, the purples and blues, it's becoming such a pain waiting for the colour to wash out before the first of September ! It turned out to be really cold today for some reason so I was patting myself on the back for wearing a denim jacket instead of a little cardigan over my tank top. Considering there's so many bright colours elsewhere in this post, you'd wonder why I'm wearing all dark colours and mainly black but I did see a photo on Tumblr today that was like "I'm wearing black on the first day of school to mourn the end of my happiness". Honestly though, I just love darker colours and black together with the light denim breaking it ! By the way, I never mentioned that the food photos are of one of my favourite dinners ever - Sticky salmon with egg fried rice ! Nothing beats it ... Except homemade pizza. Pizza beats all.